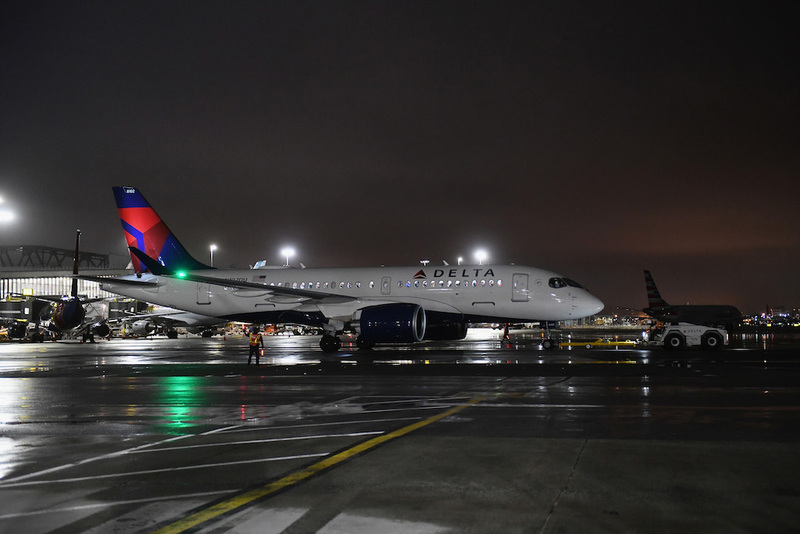 Delta Air Lines launched Airbus A220 services Thursday with an inaugural flight between New York La Guardia Airport and Boston Logan Airport. The flight marked the first revenue service of the A220—formerly known as the Bombardier C Series—in the Americas. Flight 744 left New York at 6 a.m. and landed in Boston at 7:08 a.m. Another A220 flight took off from La Guardia at 7:47 a.m. for Dallas-Fort Worth International Airport while a third readied for takeoff in Dallas for a flight to New York. The service launch marked the culmination of years of court battles and preparation for the A220's eventual operation in North America. Now flying in Europe with launch customer Swiss International Airlines and AirBaltic, as well as with Korean Air and Air Tanzania, the A220 encountered its share of hurdles before entering service with Delta, most recently involving certification delays resulting from the longest government shutdown in U.S. history. But while there appeared no doubt the government shutdown wouldn’t delay the A220’s service entry with Delta indefinitely, the airplane’s future in the U.S. appeared far less certain a year and a half ago, when the U.S. Department of Commerce proposed tariffs amounting to some 300 percent on the sale of 100- to 150-seat jets from Canada into the U.S. The September 2017 proposal stemmed from a complaint filed in April that year by Boeing that Bombardier sold the narrowbody jets for well below their cost of manufacture with the help of improper subsidies from the province of Quebec and the Canadian federal government. Happily for Bombardier, in January the following year, the U.S. International Trade Commission ruled that Boeing suffered no harm from the sale to Delta, allowing the landmark transaction to proceed. Although Bombardier eventually prevailed, the challenge by Boeing did not come without consequences to the program. In fact, Bombardier’s agreement in October 2017 to hand over majority control of the program to Airbus happened in the midst of the court battle, and Airbus’s decision to open a new assembly line in Alabama to build what would become the A220 stemmed at least partly from a desire to create a contingency in the event the U.S. International Trade Commission sanctioned the import duties. All of the legal machinations and their fallout eventually delayed delivery of the first Delta A220 from the spring of 2018 to late October. Following the A220’s first revenue flights from the type’s base at La Guardia, Delta’s plans call for A220 service from Detroit to Dallas starting next month. Schedules also call for flights from La Guardia to Houston starting in April, from Salt Lake City to Dallas in May, from Minneapolis to Dallas in June, from Houston to Detroit, Minneapolis, and Salt Lake City in July, and from New York-JFK to Dallas in August. The airplanes’ 109-seat interior includes 12 seats in first class and 15 in Delta’s Comfort Plus premium economy section.